Sony PlayStation 3 is my favorite gaming console and I use it more as a streaming device for Netflix, 3D Blu-Ray player, and to stream media from my desktop with TVersity. Sony has answered the niche where Nintendo’s Wii has reigned supreme and Microsoft Kinect is making waves with PlayStation Move Controller. Here is a quick guide to buying PlayStation Move for this Holiday season. PlayStation Move Controller $49.99 Free shipping You can purchase this as an additional controller. PlayStation 3 Dualshock 3 Wireless Controller – $44.96 Free shipping. PlayStation 3 is usually a really hot ticket item during the Holiday shopping season. 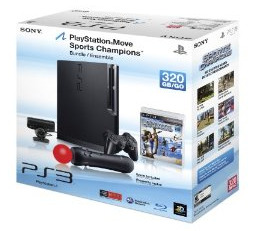 With PS3 move motion controller, there is no excuse for anyone to consider a Wii when you get one of the most advanced gaming consoles with superior media streaming capabilities. Amazon also has a nice Gaming Console buying guide you can consult.